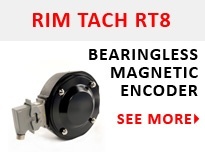 An incremental encoder can be used in positioning and motor speed feedback applications which includes servo/light-, industrial- or heavy-duty applications. An incremental encoder provides excellent speed and distance feedback and, since there are few sensors involved, the systems are both simple and inexpensive. An incremental encoder is limited by only providing change information, so the encoder requires a reference device to calculate motion. An incremental encoder provides a specified amount of pulses in one rotation of the encoder. The output can be a single line of pulses (an “A” channel) or two lines of pulses (an “A” and “B” channel) that are offset in order to determine rotation. 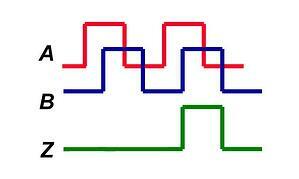 This phasing between the two signals is called quadrature. Learn more about quadrature encoder output here. The typical assembly of an incremental encoder consists of a spindle assembly, PCB, and cover. The PCB contains a sensor array that creates just two primary signals for the purpose of position and speed. An index or ‘Z’ channel can be provided as one pulse per revolution signal for homing and pulse count verification on the A and/or B channels. This index can be gated to either A or B in their various states. It can also be un-gated and vary in width. Commutation (U, V, W) channels can also be provided on some encoders. These signals are aligned to the commutation windings found on servo motors. They also ensure that the drive or amplifier for those motors apply current to each winding in the correct sequence and at the correct level. Resolvers are electro-mechanical precursors to encoders, based on technology going back to World War II. An electrical current creates a magnetic field along a central winding. There are two windings that are perpendicular to each other. One winding is fixed in place, and the other moves as the object moves. The changes in the strength and location of the two interacting magnetic fields allow the resolver to determine the motion of the object. The simplicity of the resolver design makes it reliable in even extreme conditions, from cold and hot temperature ranges to radiation exposure, and even mechanical interference from vibration and shock. However, the forgiving nature of resolvers for both origin and application assembly comes at the expense of their ability to work in complex application designs because it cannot produce data with enough accuracy. 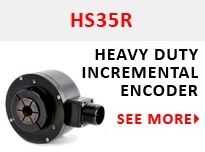 Unlike incremental encoders, resolvers only output analog data, which can require specialized electronics to connect with. 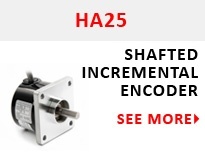 Absolute encoders work in situations where accuracy for both speed and position, fail tolerance, and interoperability matters more than system simplicity. The absolute encoder has the ability to "know where it is" in reference to its position in case of system power-down and restart if the encoder were to move during a power-down. Heavy Duty: demanding environment with a high probability of contaminants and moisture, higher temperature, shock, and vibration requirements as seen in pulp, paper, steel, and wood mills. Industrial Duty: general factory operating environment which requires standard IP ratings,moderate shock, vibration, and temperature specs as seen in food and beverage, textile, generally factory automation plants. Light Duty/Servo: controlled environment with high accuracy and temperature requirements such as robotics, electronics, and semiconductors.